Caption slip reads: "Photographer: Brunk. Date: 1957-11-20. Reporter: White. Assignment: Water hearing. 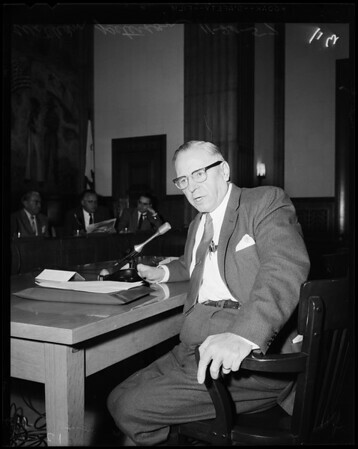 B-11: On witness stand -- William S. Peterson, L.A. Dept. Water & Power's genl manage & chief engineer. B-12: General view of hearing -- joint committee on water resources development problems".